This incalmo fluted bowl features 3 separate sections along with a shiny black lipwrap that come together to form an absolutely stunning and elegant bowl. Each section was formed as its own separate molten bubble, then they were fused together and blown out as one unified bubble using the incalmo method. 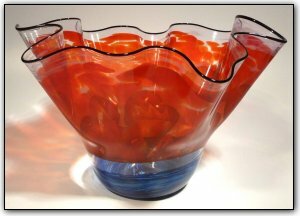 The bottom features a deep and luscious blue with subtle white highlights, then comes a band of clear, and the 3rd section features lovely shades of reds again with subtle white highlights swirling around. Make sure to zoom in to see just how amazing each of the colors are! This bowl can be displayed upright or can also be displayed on its side, and is sure to be an elegant addition to any room.